A ROARING HAPPY NEW YEARS!!! The perfect candid represents the great '08! MSR is OFF and plans on chiming back in Friday morning with loads of newness and freshness! Take great care and we look forward to seeing you next year! 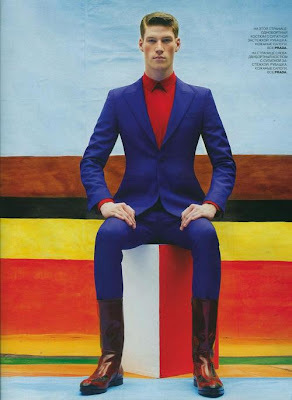 The current installment of Lens: This Week In Style, features much more dazzling stylish male figures than normal editions. Style carries no limit so why limit exposing your eyes to freshly put-together subjects. Know-how stylist hands of course patent this WOW look! 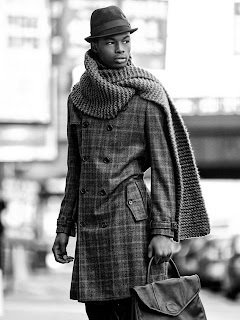 The sleek windowpane coat, comfy knit scarf, smashing fedora and look-away pose fuels the masterpiece witnessed atop. 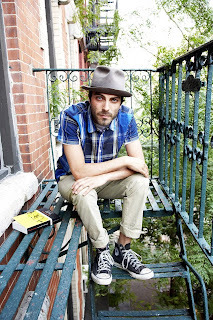 The gentleman channels Mr. MSR new summer pastime: Hangin' with a rich novel on the fire escape while fitted in casual-breezy pieces. No Converse on this side, but Havaianas sandals easily works for the effect. Every time we preview this "Style Scholar" we well up fashion envy--in the most non-threatening way--of how immaculately shaped his ties and pocket squares always are. Also, he dons a double-breast like a perfect glove. We love the candid shot! 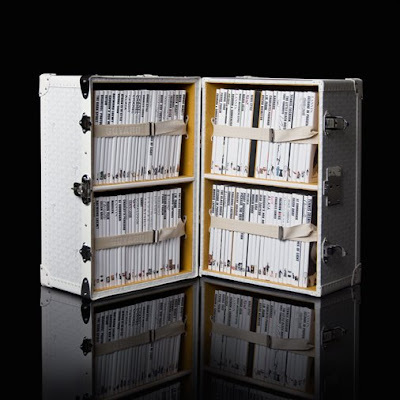 Witness individual styles from author Tom Wolfe (opts for decking only in white suits) ; Ralph Lauren executive, David Lauren; and famed photographer Mark Seliger. Clothes, check. Beautiful face, check. The pose, a fat check! We had to yank the shot from the current Vogue. The amazon beauty captured our full undivided attention. Winter garbs meshed carefree and untrained looks chillingly terrific! We’re absolute fans of the online model’s way-too-cool-for-school stance! The pitch black shades paired with a tilted red baseball cap blends great. T.C. always on cue with megawatts, shines for the Valkyrie film premiere in a frame-heightening charcoal double-breast number. 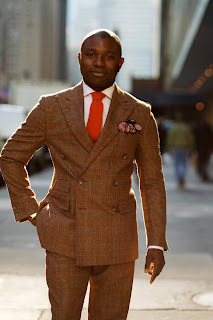 The killer shot screams Fall yet Winter-ready, Gents. The tree stump and chunky belted knit and lightly tattered leather defines the stellar shot!! 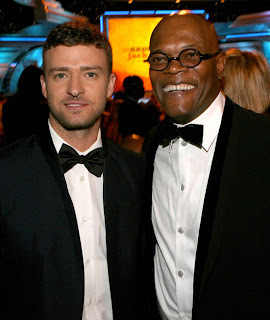 Clean cut well-tailored tuxedos always command a look-at-me; as the case with J.T. and Samuel Jackson. I hope EVERYONE enjoyed a fan-mazing Christmas! We sure did! Now we're back on track to delivering the best-of-best in Men’s Lifestyle. 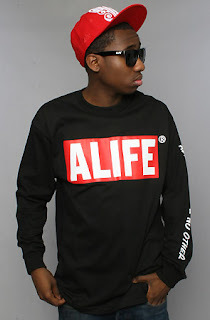 Let your life be what it is. Do not expect individuals, events, objects and circumstance to provide the satisfaction you are seeking. They will not. Indeed, they cannot.In fact, only the "whole core" will satisfy. of your life, this larger wholeness is constantly manifesting. And, when you trust this larger movement, nothing more will ever be needed. 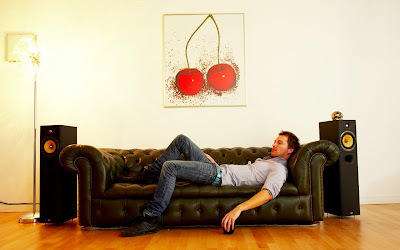 CHRISTMAS GREETINGS FROM MALESTYLE REVIEW! To everyone reading today, we wish you and yours a MERRY CHRISTMAS! 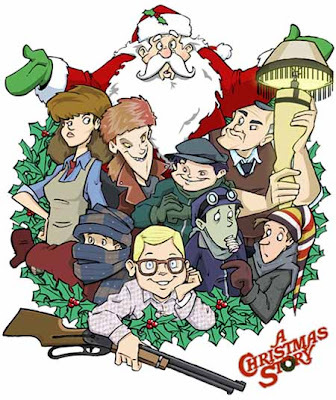 We plan on feasting on loads of delectable grub and watching all-time favorite Holiday flick, A Christmas Story--with the charming Ralphie Parker. Enjoy the reason for the season! Recently we embarked on a quick trip to destinations with heated degrees. Upon our return, we were met with disgusting winds and bitter blows to our joints. 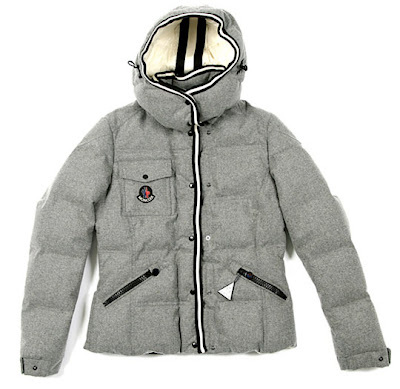 That’s when thoughts about our new Moncler favorite, (we donated the shiny jacket and opted for a classic and minimalist Moncler for the season) constructed through collaborative designing for Colette & GAP capsule collection uprooted. 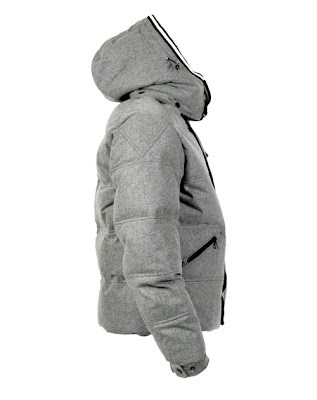 The flannel down puffer releases warmth even before buttoning the up-to-the-neck snaps. Although the limited edition jacket been close since last September, we still obsess each time the stately jacket battles the wintry outdoors. We hope you stormed out to sample, better yet, purchase a few bottles of our recent fragrance recommends. Continuing the must-purchase grooming list, MSR sampled scores of plush men’s beauty goodies, narrowing down our top-top favorites. If you seek quality-enriched and beauty-enhancing skin care products, AVEDA automatically should arise in mind. 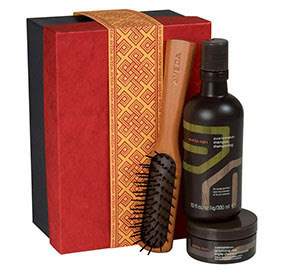 AVEDA’s men-oriented Grooming Traditions set is a neat gift for the special Gent near your heart. The full-size set comes brimmed with Aveda’s: Pure-formance Shampoo and Grooming Clay (similar to hair pomade) and styling brush which creates slick manly coiffures. The added bonuses, MSR firmly adore the organic essential traces of spearmint, vetiver, citrus and lavender. It puts your other rich musk scent products on the back shelves. Here’s a grooming label all familiarize with—especially the facial washes. Neutrogena for the holidays constructed a sizable gift set, fueling the best clinically proving ingredients to fight off facial negative properties. 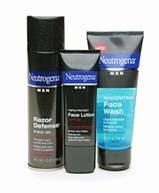 First off, the set introduces men to the Neutrogena Men Invigorating Face Wash--purposed for sloughing away oily excesses; a Men Razor Defense Shave Gel which help heighten the skin’s resistance to razor irritants; and lastly, Triple Protect Face Lotion SPF 20, a finishing agent which imparts healthier-glowing skin. You have abilities and powers that you're not even aware of. You were born with these powers-- but you have never learned how to master them. Your success starts in your mind. Doctors and scientists now firmly believe that 75% of all sickness and disease starts in the mind. Researchers have also proven that stress, which starts in the mind, is the number one cause of all fatigue and illness. Scientists have also proven that we only use 10% of our mind. The rest is never used properly. That means 10% of our mind is causing 75% of all sickness -- and we don't even know how to use that 10% properly. Imagine what would happen if we used our mind to it's fullest? We would stop getting sick and live healthier, more productive lives. Best of all you would be able to create the success you want in life! Don't procrastinate until New Years to exercise the powers of positive and well-being thinking. Start today with baby steps and watch how highly increased areas of life becomes. Top 25 things vanishing off the American landscape. iPhone users are gifted with a picture-perfect app. (abbreviation for application) for the Holidays. Shoot away, we say! We have been tabbing the political tittle-tattle with Gov. Blagojevich since breaking on CNN. Now, the plot thickens as President-elect Obama delivers communication reports between advisers and Blagojevich. Today at 4:35pm EST. the release shall be made public. Dumping fat and obese body associations, studies find congestive heart failure erupting amongst pudgy men. Well-tailored designers Belstaff (the brand creates immaculate safari jackets—especially the leather models) is tapped to craft pieces for Daniel Radcliffe upcoming Harry Potter picture. 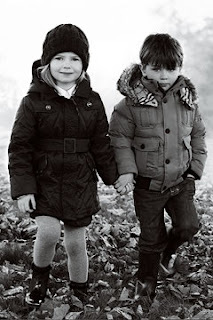 Designer labels are affording kiddies an extra grownup look with plentiful options. Trenches to dapper bombers can be taken off kids racks nowadays. 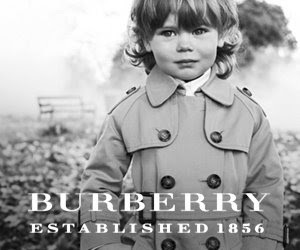 Burberry’s sent forth their childrenswear product shots; the most high-fashion kids’ campaign we came across in our days of scoping the kiddy markets. It’s crazy (in a nice way), to see kids in actualized poses and modern silhouettes. Burberry, J.Crew, and even Dior are adding a new luxury category to the fashion pie chart. Scope though select MSR faves we pulled from Burberry’s brochure. Seeking occurs in time, and follows a path out of the present moment into an imagined future. Discovery is grounded in the present moment, centered here and now. Seeking focuses on a distant goal. Discovery focuses on immediate reality. Seeking is fueled by restlessness and longing. Discovery is delighted, fulfilled and satisfied. Seeking is predicated on lack and grasping, and a sense of something missing. You and we right-out know George Walker Bush achieved the most-disliked-president honor since the dim inauguration day. So, when we heard Bush got socked—twice, not once—with size 10 brogues over in Iraq, we were in absolute shock. Two shoes. Yikes! To think, someone (a journalist) conjured the guts to carry out an uncouth act with the world’s best security force (quoting Prezy-elect Obama) on his hip. Listen to his reasoning for the rude and disrespectful act: He received countless hassles at airport security checkpoints for having an Arabic surname. We don’t buy your frail excuse one bit. Whatever the jail penalty, we say it’s rightfully deserving for his bad-mannered actions. Bush, you have some great reflexes and love how unfazed you were over the incident. LOL! Saturday night was bittersweet after seeing comedian great Amy Poehler farewell loyal fans during her last on-air skit of Weekend Update. Just to reflect, she made us laugh, even cry-over (literally) from her riveting bust-out sketches. We retained many Amy favorites over the seven years! Our best standouts have to be Poehler’s on-target Hillary Clinton impersonations and all “Bronx Beat” parodies!! To be honest, all the SNL GREATS left. We only have the ingenious Seth Meyers still standing. I am sure Amy will make return performances time-to-time and pursue her strengths as a remarkable comedic actor. DAG…we are really going to miss you Amy P.
SNL glory days starring Amy P and Maya Rudolph! 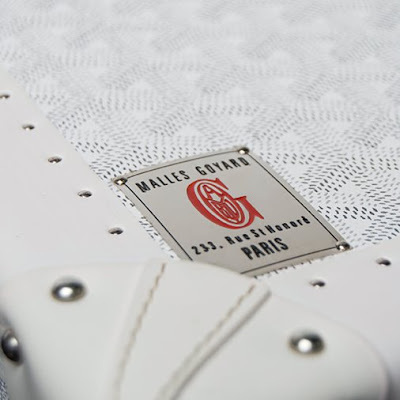 Visionaire Magazine (MSR monthly read) first held high rankings with MSR for a wonderful over-the-mighty-top trunk collaboration brokered with GOYARD. Don’t rest on your laurels and accolades; because other competitors are shimmying in the rear for personal and recognizable shine. 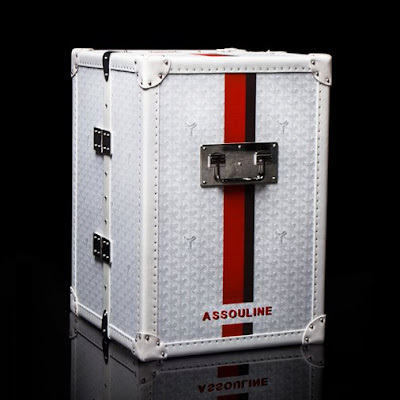 It seems luxury publishing giant, ASSOULINE, wanted hearty chunks of GOYARD-collaboration soufflé. 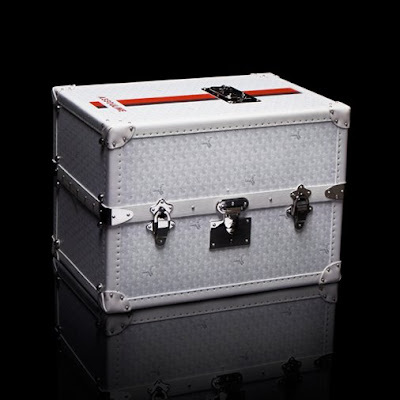 The literary house blew away Visionaire from the #1 spot with a jaw-dropping milky-white lock-and-key leather trunk. 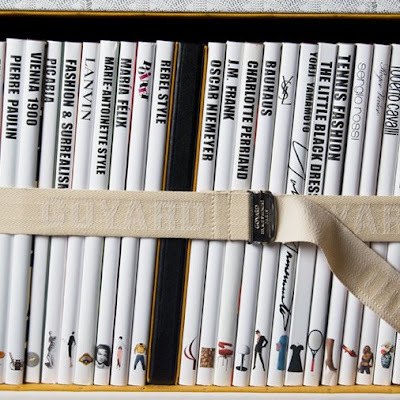 For a whopping—take a breath—$20,000, the limited-edition can be yours! Products this glitz and high-flown answers why luxurious brands are meeting financial projections during a proclaimed recession. Can you say product-smitten! 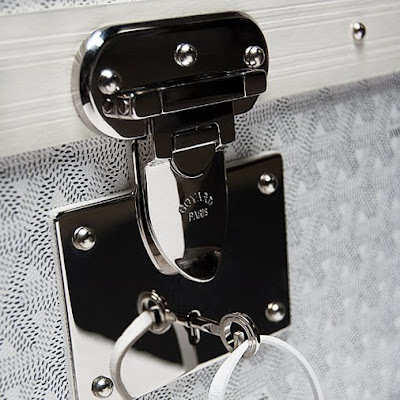 In conjunction with the ornate monogramming and pristine metal finishings, the trunk comes well-stocked with scores of literary lifestyle reads by: Lanvin, Balenciaga, Jean-Paul Gaultier, Poiret, Eames (stellar furniture maker), Veuve Clicquot Yellow (best champagne ever! ), Yves Saint Laurent, and loads more. We compiled detailed close-ups to explain why it is worth every single penny of $20,000. A wise gent once told us during meaningful conversing, “Posing conveys worse than unscripted posing.” This following “lockdown shot” is perfect proof—literally. While touring The Selby (a site which documents internal home views of popular artists and tastemakers) recently, the candid shot of English stylist Mark Morrison(Hèrmes, i-D Magazine) captured our full-attention. The minimalist aesthetics in the backdrop might have fueled the shot, but it’s still a stunning photo! Below, a video showcasing Mark’s fashion tome-size pictorial. COMME DES GARÇONS HAVING FUN! During a recent fashion assignment, we previewed a gentleman sporting the neatest raw-hemmed sweater. We queried, and found out it was by artsy and unusual label Comme des Garçons. 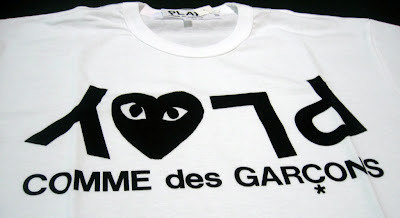 Until that point, we lost track of how creative and terrific CDG garments were. 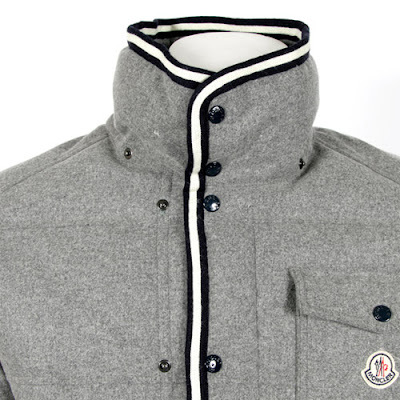 Because of the gentleman’s sweater, we reached out to CDG to heed the new creations. Thank heavens we did! 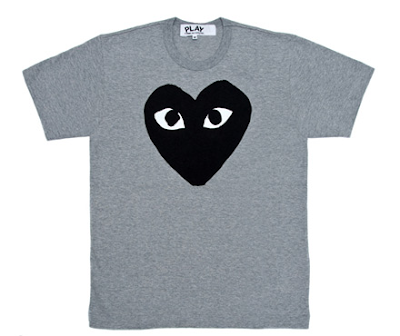 MSR absolutely hearts (no pun intended from heart symbol) PLAY by Comme des Garçons new offerings (this season) . Along with the quirkiness energy, PLAY’s cut-and-sew assortments fit like a dream. Not overly tight, and not boxy. Plus the head-turning and check-me-out designs are neat choices if opting for a streetwear effect; a fashion-theme we prefer whipping up when casually sipping a caffe latte. The Louis Vuitton flagship store gets literally wrapped up for the holiday season. Let's thank Takashi Murakami for the casing monogrammed art! 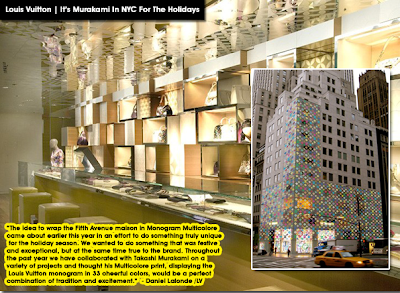 If in NYC, visit Louis Vuitton (57th and 5th Ave.) to see the facade installment! At the break of the month, MSR started receiving loads of grooming products and information. A hearty THANK YOU to all our men’s grooming partners (Estee Lauder, Johnson & Johnson, Aveda, Coty, just to name a few) for submitting products to roundup our holiday grooming feature, for the MSR readers. 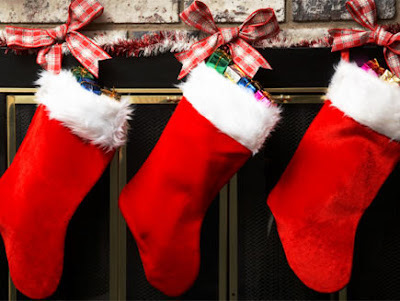 This holiday season we decided to opt for neatly grooming stocking stuffers; nothing too big, nothing too wild. 1. Hilfiger Collection Gift Set by Tommy Hilfiger—Tommy Hilfiger since TOMMY for Men (remember the superstar cologne!) continues whipping up signature scents, never to overpowering. Once more, the designer has blended clean, super-crisp, energized masculine scents. Encased in a miniature box-shaped glass, the lasting sensual scents of Bergamot, Mandarin, and strengthen grapefruit makes this a must-buy holiday assortment. To add, the moisten shave balm absorbs through the pores leaving off a perfume scent. 2. 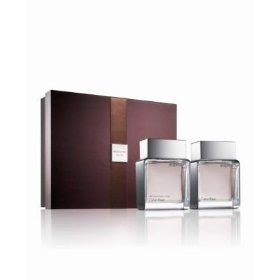 Calvin Klein “Euphoria” Gift Set—Before pushing down the nozzle to release the intoxicating yet delicate scent, the spirited ingredients of ginger pepper cocktails, patchouli, amber, Brazillian redwood, and chilled sudachi, peppered us up. The after scent saturates a gentle woodsy and musk tone, we noticed. Along with the refreshing and superior scent, Euphoria’s modular shaped bottle grants aesthetic tastes to the gift recipient. Stay tuned for Part II where we reveal our best facial grooming goods currently raving the market. 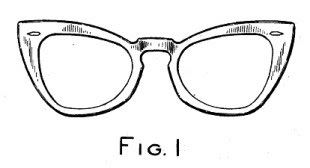 U.S. design patent from 1953. 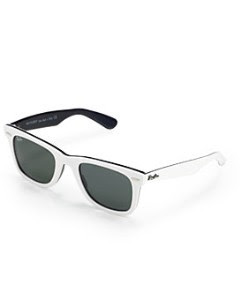 Raymond Stegerman created venerated and iconic sunglasses—the Ray-Ban’s. Early Ray-ban adverts targeted Gents, but grew a more unisex appeal towards chic women. From 50’s into 2000’s, the modern trapezoid-shape specs are framing all types of faces worldwide. 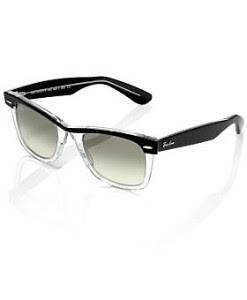 To date, we read, the enduring styles are the best selling sunglasses in the eyewear category.How great! 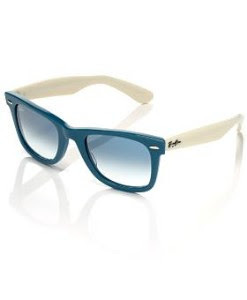 All this week, Ray-Ban new “colorize” styles have bombarded the masses with launch parties (Bowery Ballroom) and magazine collaboration (GQ!) events. Mr. MSR made the trips and colored out with the reintroduced frames. The spanking new designs offer multi blends of hued lens mixed in with pop-color accents. Put it this way, Ray-Ban’s new offering ranges with ALL your varied or unchanging outfits. See the Ray-Ban favorites we have resting on our nose bridges. 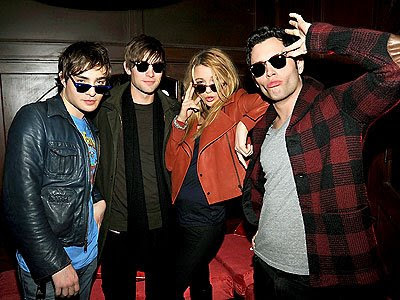 The Gossip Girl cast rocking out their fresh Ray-Bans at Bowery Ballroom. 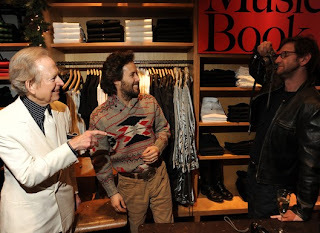 Quick side note: Penn Badgley is sporting the best shawl-collar knit jacket we've seen all season. Even 50+ Madonna masters flexing luxurious fashion with confidence!! 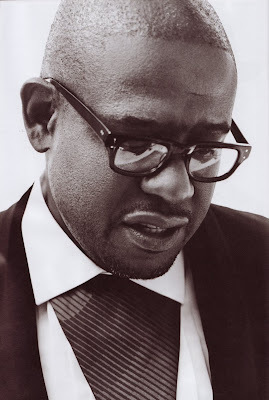 Forest Whitaker in a relaxed shot (L'Uomo Vogue) cornering every ounce of elite style. The Beckham's shutting down NYC in fashionable tailored attire! Forever appropriate these two. The Carters at the recent Art Basel looking rather comfortable and proper previewing fantastic art. Jamie Foxx looking winter-ready in a brilliant tailored peacoat which screams HOTNESS! BTW, lose the massive gloves. Slim fits look appropriate for the bombing outerwear. Rummaging through the archives the powerful shot appeared. 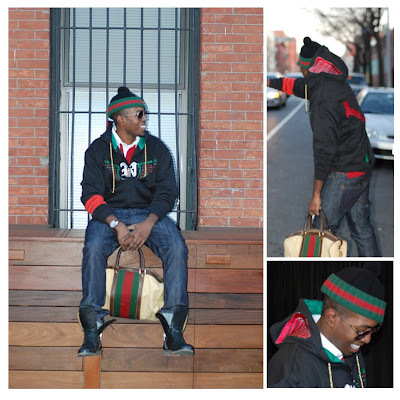 This lad intermixing GUCCI accessories, executes a great, great job! !